I've just tried this recipe and it makes a perfect autumnal accompaniment to a hot drink. Or great on it's own! Any excuse really. Not only tasty, it's beautiful too. Sticky, sweet, with a dense sponge and a kick of brandy. A perfect treat for this time of year. The finished product. Toffee a little crispy around the edges! Put the sugar and butter into a frying pan and put on a low heat. Stir regularly until it forms a dark brown caramel. Don't let it turn black. **Be very careful! ** Do not get any mixture on you, and definitely do not lick the spoon. This mixture gets exceedingly hot and will burn. Take the pan off the heat. Add in the apple slices. Be careful as the mixture might spit. Stir them around until they are coated. 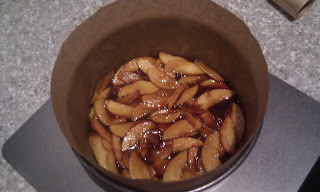 Arrange the apple slices in the bottom of the cake tin however you want and pour the caramel over them. 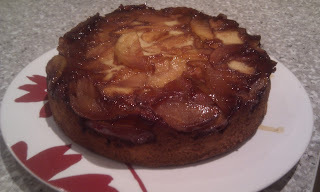 Top with the cake mixture, smooth until it covers all of the apple slices. Bake for 30-40 minutes until the cake has risen, is golden and is cooked through. Ensure the cake is ready before removing from oven. Leave it to cool in the tin before turning upside down onto a plate. The apples will now be the cake's topping. It's particularly nice when warm!